Sectional garage doors or panel garage doors have become the world standard due to their inherent security, functionality, insulation and draught-proof qualities. You no longer have to sacrifice performance and good looks to stay within your budget. With our vast selection of models, colours and window options your garage door will become an architectural focal point… the first thing visitors see! Our sectional garage doors can be fitted as either electric or manual operation. Electric operation comes with multiple handsets, wall mounted trigger and, if required, manual release to enable use during power cuts. The doors are all spring balanced which makes for effortless operation in manual mode, regardless of the door size or weight. 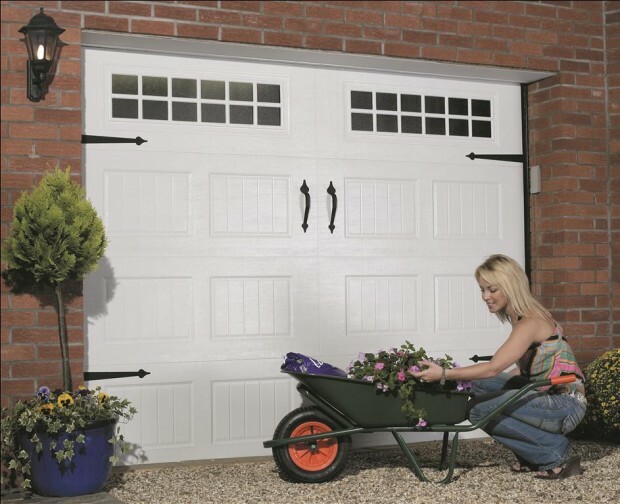 All the sectional garage doors we supply run in tracks at either side of the garage and have a PVC strip along the bottom of the door, this gives excellent weather proofing performance. If you have either a room above your garage or a door leading into the house from the garage you can opt for one of our insulated doors which can dramatically improve the temperature in your garage and home. Sectional doors seal into tracks at either side of the garage. This prevents access around the edges of the doors. Door thickness can vary from single skin steel to 42mm insulated panels providing further robustness. Garador, Hormann and GDS all offer doors with specific upgrade to Secure By Design doors. This is the highest architectural standard for security rated for the residential garage door market. Our sectional garage doors all provide multi point locking when in installed as manual. When automated the doors are held on a positive lock on the motor, If you choose a Garador or Hormann motor they also come with a mechanical lock fitted into the motor boom. If you choose to go electric, this helps prevent forced entry and provides your home with superior security. As sectional doors open vertically they are especially suitable for short driveways where they allow cars to be parked right up to the door. Sectional garage doors can be fitted behind or between your garage opening to give you space where you need it most. Moving a frame behind the brick returns can typically save up to 140mm of width, giving you the room to get the wing mirrors in.